Welcome to our website! If you are looking for fast, friendly, reliable service you are in the right place. We are here to help you. Please check out our 3 new videos directly below. Jim & Sons Transmission has two shops now to serve you better. One in Cuyahoga Falls and the other in North Canton. Stop by and say hello if you are in the area. Our main goal since 1958 when we opened has been to help you with all of your transmission and drive line problems and be the very best in our field. If transportation is a problem, we have rental cars available. Each transmission technician at our automatic transmission repair shops, serving the greater Akron and Canton areas, are highly qualified and ready to assist with their expert knowledge. Jim & Sons Transmission invites you to take advantage of our easy 24/7 online scheduling! Simply complete and submit the appointment form to schedule your repair. Jim & Sons Transmission offers our customers in the Cuyahoga Falls ~ North Canton area nationwide protection. Our warranties are among the best in the automotive repair industry. Jim & Sons Transmission is always interested in hearing from qualified individuals seeking employment at our Cuyahoga Falls ~ North Canton automotive repair shop. 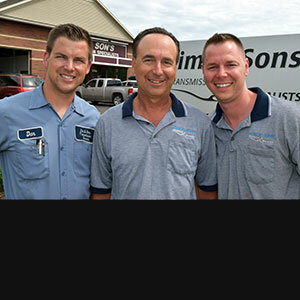 If you are interested in joining the Jim & Sons Transmission team we want to hear from you. Their pricing was MORE than reasonable. Hopefully I will not need their wonderful service on a routine basis but if I do, I will not hesitate to return to them. "Normally when one hears the word "transmission" it is asscociated with the phrase "national debt"! This is certainly NOT the case with Jim and Sons. I found them to be very friendly, honest and accommodating in our dealing. Their pricing was MORE than reasonable. Hopefully I will not need their wonderful service on a routine basis but if I do, I will not hesitate to return to them. Thanks guys!!!" Jim & Sons welcomes invites you to watch the videos listed above to learn more about our family-owned & operated transmission repair business that has been serving the greater Akron and Canton area since 1958.